Apple, the name describes everything about the brand. The word brand is not good enough to describe Apple. The company manufactures consumer electronics, computer software and hardware. Company’s founder Steve Jobs did his best effort to amuse and surprise the world with their innovative invention and introduced highly secure electronic gadgets which have smart, unique and solid built with extravagant features. Apple has introduced many products and took imposingness in electronic market of whole world. Apple started its journey in 1976 as a computer manufacturing company and still doing its work with full passion. 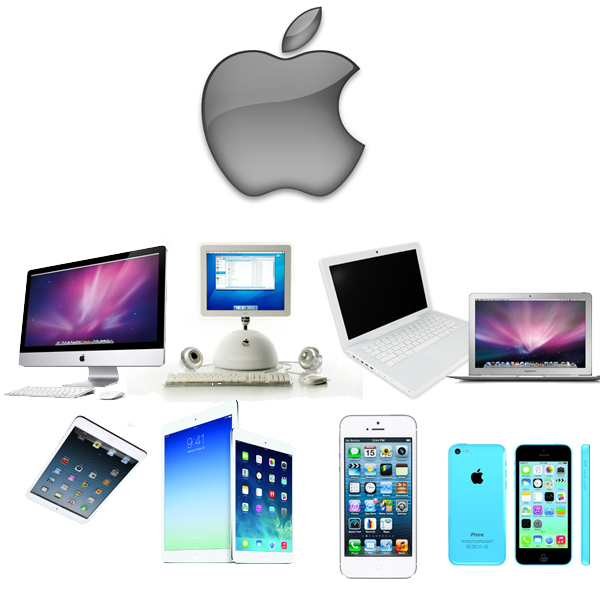 Take a look at the list of its top products which are still in use and rapidly increase the business of the biggest consumer electronics company ‘Apple’. Mac is the marketed name of Macintosh. Mac PCs are designed and developed by Apple Inc. The first Mac PC was introduced in January 1984 which runs on company’s own Operating System called Macintosh OS which is supported on only company’s own PCs. The OS is classified in two series; first one is called Classic Mac OS (with 9 revision) and the second is OS X (10 revision, from 10.1 to 10.9). This brand’s computers are preferred by professionals specially, because of its highly secure feature. Latest OS of Apple is OS X version 10.9 Mavericks. New Macs are capable of running another OS like Linux and MS- Windows through third party software. The latest invention of Apple, in the series of its Mac desktop computer is iMac. iMac, the name and design delineates everything about the system. This device is designed perfectly with ultra thin body. The PC looks very stunning and elegant. The ultra thin device is pack of ‘All in One Machine’ which houses processor, motherboard and everything in one, seems imaginary and forces you to surprise for the innovatively engineered device. The system is equipped with great widescreen (75 percent less reflective), NVIDIA graphics, advanced Fusion Drive option and Thunderbolt I/O. It is loaded with powerful apps and uses the latest Mac OS X Mavericks. MacBook are the series of notebook computers which are manufactured by Apple Inc. Apple has introduced many MacBooks; the latest inventions are MacBook Air and MacBook Pro. They uses Intel core Duo processor. Although company had stopped to develop more MacBooks but they are still selling and attracting Indian consumers. The device is 1.7MM thin and weighed 1.08kg, coupled with aluminium unibody which makes the device handy and tough. The MacBook Air is powered with good battery which lasts upto 12hrs. It comes in two screen sizes; 11 inch and 13 inch. The device is blessed with latest Intel processor which is very fast. Its HD Graphics 5000 is perfect for editing photos. iPad is an Apple product in tablet segment which runs on Apple iOS. The latest model in the segment is iPad Air and iPad Mini which were released in October 2013. These devices support virtual keyboard. Foxconn is in contract with Apple to manufacture its tablet series. The first iOS for old iPads is iOS 5.1.1 and the newest release is iOS 7.1.
iPad Air is 7.5MM thin device, weighed less than half Kilogram, amazed you with its stunning looks. The device has A7 chip which gives the performance better than enough. It promises the powerful battery and coupled with 2 antennas which is quite enough to connect with Wi-Fi and other connectivity options from any of location. This iPad is loaded with many unique and smart apps like iPhoto, GarageBand, Pages, iMovie, Keynote, Numbers and many more. It uses iOS7 which just enhances the iPad Air. It is available in two color variants; Space Grey and Silver and comes in two models; Wi-Fi and Wi-Fi plus Cellular. iPhone is developed by Apple Inc. in the range of smartphones. The phones are equipped with all smart features and look very elegant and enclosed in solid body. Its first generation device came in the market in 2007. First iPhone is introduced with the name of iPhone 3G. The successive series of iPhone includes the names of 3G S, 4, 4S, 5S and 5C. 5C is the latest invention of Apple in the iPhone series. iPhone 5C is presented with brilliant color combination. The device is engineered with brilliant features and runs on latest iOS 7. Overall the device looks great. The iPhone is loaded with many powerful apps. The device is also equipped with finger print sensor and sports quality iSlight camera. It is available in 16Gb and 32 GB variant.